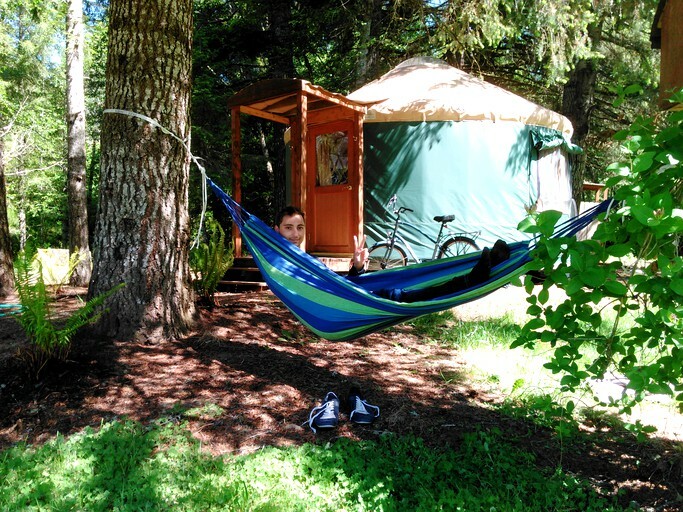 These beautiful yurts are located near the charming town of Vernonia near Portland, Oregon, and redefine glamping with a unique design. They are exceptionally well-maintained and equipped with a queen-size bed, quality linen and towels, and boast lighting and power to stay connected to the outside world. High-speed internet is provided, along with pristine bathroom facilities that are shared between glampers, though boast individual shower and toilet units. 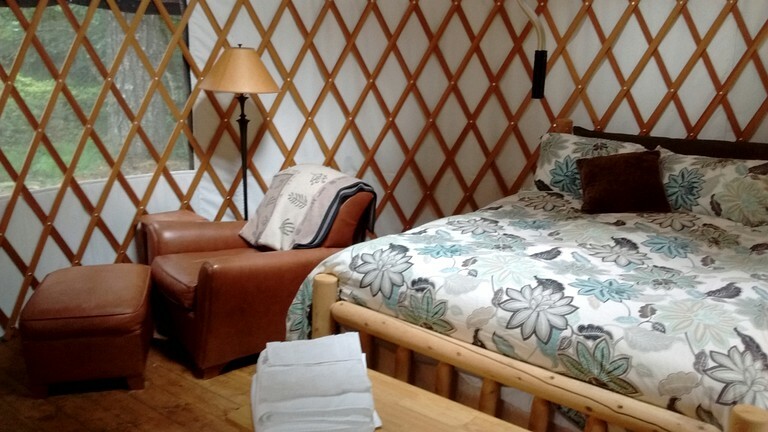 While the yurts are cool, the straw-bale day lodge is probably unlike anything guests have seen before! 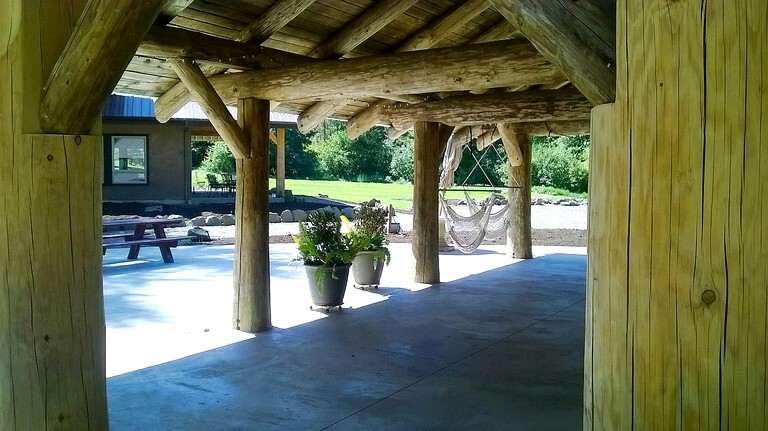 The 3,500-square-foot day lodge is the first permitted straw bale structure in Columbia County’s history. 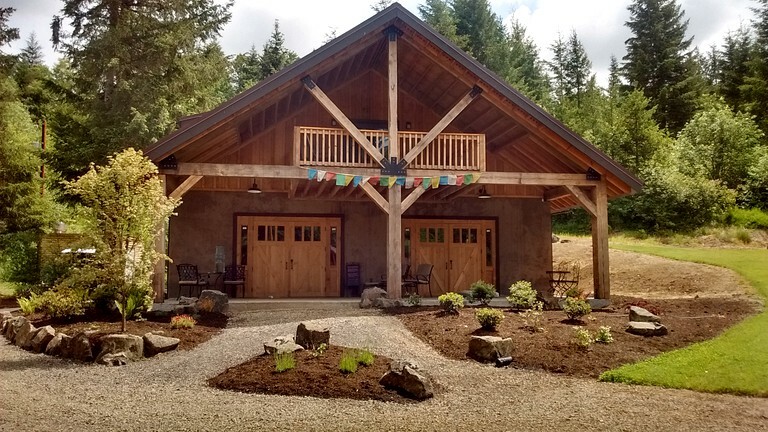 Access to the lodge is also available during the hours of 7 a.m. to 8 p.m. for such things as using the sink, refrigerator, filtered water, hot pot, French press, etc. The large log pavilion between the pond and day lodge is also a place guests will want to hang out. Guests can relax in a hammock or hanging chair in the pavilion or in a comfortable chair on the dock. The property has plenty of tables and chairs for eating meals and playing games. The hosts provide the following games: bean bag toss, bocce ball, giant Jenga, and horseshoes. Board games are available as well (Scrabble, chess etc). Guests can use their handheld devices to connect wirelessly to free Wi-Fi. The pavilion is a great place to hang out even on those rare rainy days during the summer. At night, if guests would like to have a campfire, the hosts will light one up in the community fire pit near the yurt. Popcorn and s'mores kits are available for purchase. The hosts have a basic limited menu that is value priced. No cooking or dishwashing is allowed at the retreat. 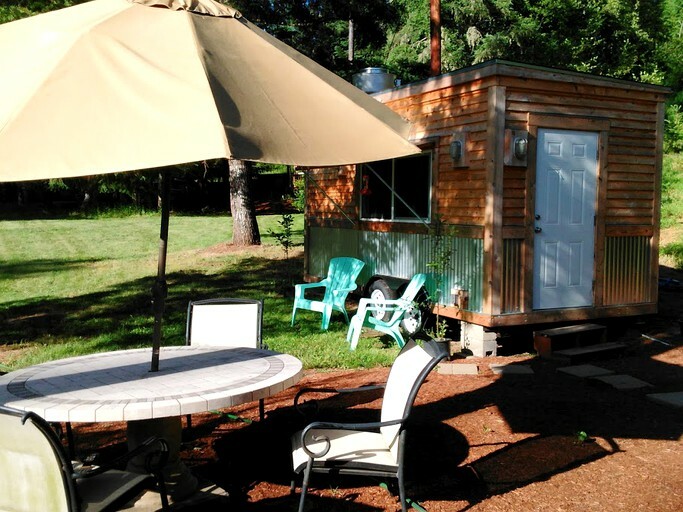 The small community of Vernonia and its surrounding area attract tourists from near and far. The Banks-Vernonia State Trail is truly exceptional and must be ridden by anyone traveling to the area. 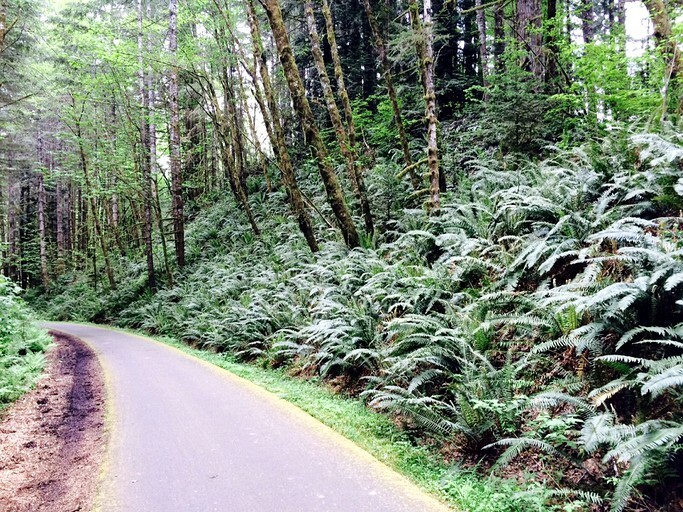 If guests haven’t ridden the Banks-Vernonia State Trail before, they can add this to the bucket list! The BV Trail, as it is called, is truly one of the best “rails to trails” bike trails in the U.S. The trail dissects the Vernonia Springs property so access is several hundred feet from the main gate. The hosts rent awesome Trek hybrid bikes, comfort cruiser bikes, and ebikes to make the ride through the rainforest as comfortable and enjoyable as possible! A perfect ride is to head north on the trail six miles into downtown Vernonia. The total round trip distance is 12-14 miles. 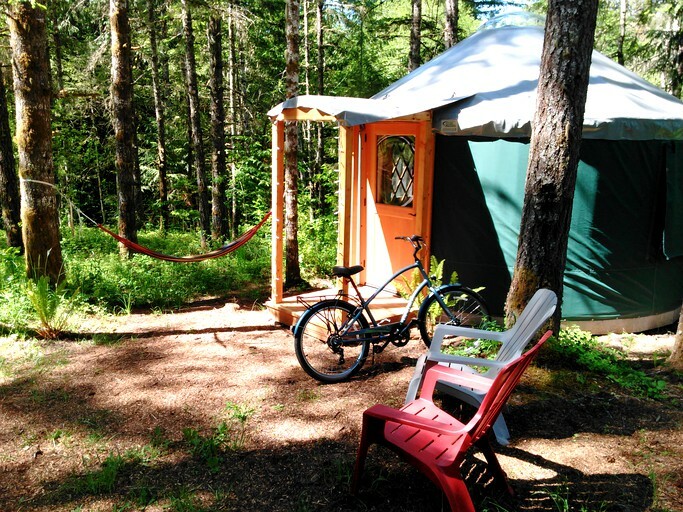 If guests want more of a challenge they can head south on the trail towards Stub Stewart State Park, which is four miles up the bike trail and 15 miles to the trailhead at the city of Banks. Stub Stewart State Park has an awesome frisbee golf course, as well as a stellar mountain biking trail complex for all skill levels. 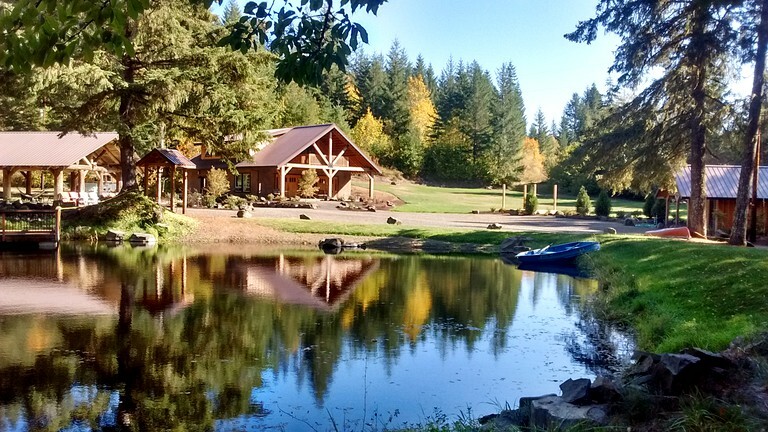 Besides the Banks-Vernonia Trail, the property also has miles of nature trails for guests to enjoy. Beaver Creek runs through the property and is home to rainbow trout and spawning salmon in the fall. It is an amazing site to see these large fish in six inches of water! The City of Vernonia has a good market, a gas station, a hardware store, several bars, restaurants, and a golf course. There is also a really well-done timber museum that is worth visiting. Cannon Beach and Seaside are less than an hour away by car, and Portland is only 45 minutes away.